EUR continues to trade in the narrowing lateral channel against USD. Last week, the euro was supported by strong data on the consumer price index in France and the German labor market, and at the beginning of this week there were negative releases on the Manufacturing PMI of France and Germany and retail sales of the eurozone as a whole. In addition, the conflict in the coalition government on the issue of migration policy has again ripened in Germany. This trading week, the main data that may affect the dynamics of the pair, will be released on Thursday and Friday. The US will publish the statistics on nonfarm payrolls, unemployment rate and initial jobless claims. It is possible that releases of the end of the trading week in the US can be the impetus that will help the pair overcome the level of 1.1500. After the breakdown of this level, the pair will open new horizons, namely, the level of 1.1000. 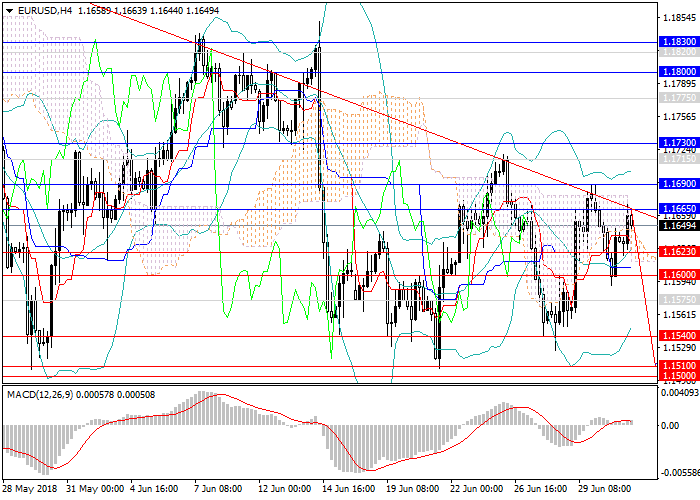 An alternative option would be a transition to a longer upward correction with the target levels at 1.1830 and 1.1850. Technical indicators on the D1 chart and above confirm the forecast: MACD indicates the preservation of the high volume of short positions, and Bollinger Bands are directed downwards. Support levels: 1.1600, 1.1575, 1.1540, 1.1510, 1.1500, 1.1470, 1.1430, 1.1350, 1.1300, 1.1000. Resistance levels: 1.1665, 1.1690, 1.1730, 1.1800, 1.1830, 1.1950, 1.2000. In this situation, short positions may be opened from the current level with the target at 1.1300 (1.1000 in the midterm) and the stop-loss at 1.1760.